accretion - the build up of beach material, often used when talking about increases in the size of a beach. beach - an accumulation of non-cohesive material located between dry land and the sea and effected by waves, tides and currents. beach crest - the furthest extent that a normal breaking wave will run up a beach. beach plan shape - the shape of the beach in plan, usually shown by contour lines or recognizable features. breaker zone - the zone within which waves approaching the coast begin to break, typically in water 5 to 10 metres deep. bypassing - moving beach material from the updrift to the downdrift side of an obstruction such as a river, marina or groyne. chart datum - at Brighton chart datum is 3.4m below Ordnance Datum (Newlyn). Chart datum varies from place to place. Chart datum is the approximate level of the lowest tide excluding meteorological effects ie. only astronomical effects. coastal cell - a stretch of coastline within which sediment movement is self contained. For Brighton and Hove this is Selsey Bill to Beachy Head. coastal defence - a general term encompassing coast protection and sea defence. coastal processes - collective term covering the action of natural forces on the shoreline and nearshore seabed. coast protection - the defence of the coast from erosion and encroachment by the sea (see also sea defences). Defra - the governmment department responsible for formulating policy for the coast (formerly MAFF). downdrift - in the direction of longshore drift. Environment Agency - an executive agency of Defra. The Agency has many areas of activity, on the coast they have an overarching supervisory duty over all defence activities. They are also responsible for approving applications for grant aid towards works and studies on the coast. fetch - distance over which the wind acts to generate waves. gravel - a material finer than pebbles and coarser than sand, between 2 and 4mm in diameter. groyne - usually a narrow structure of concrete, rock or timber built roughly at right angles to the coast to capture and retain beach material to enable the development of a beach. groyne bay - the section of beach between 2 groynes. hard defences - general term which applies to impermeable coast defence structures made of concrete, timber, steel, masonry, etc. which reflect a high proportion of wave energy. littoral drift - the movement of beach material in the littoral zone by waves and currents, includes movement parallel (longshore drift) and perpendicular (cross shore transport) to the shoreline. littoral zone - area which extends from the head of the beach seawards to the limit of wave induced sediment movement. longshore drift - movement of beach sediments approximately parallel to the coastline. mean sea level - the level of the sea taken over a period of approximately 12 months, taking account of all tidal effects but excluding meteorological effects. neap tides - the period in the lunar month when the difference between high and low water is at its smallest (see also spring tides). offshore - the zone where sediment movement induced by waves alone effectively ceases and where the influence of the sea bed on wave action has become small in comparison with the effect of wind. 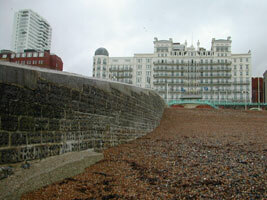 overtopping - water carried over the top of a coast defence due to wave run up exceeding the height of the defence. pebbles - well rounded beach material between 4 and 75mm in diameter. recycling - the movement of beach material from a downdrift to an updrift area. soft defences - a term usually applied to a defence which absorbs and reflects wave energy rather than just reflecting it, typically granite boulders or shingle beaches. spring tides - the height of high and low water varies through the month according to the phases of the moon. The highest and lowest tides usually occur just after new or full moon and are known as spring tides. tidal day - tides are governed by the lunar rather than the solar cycle. The lunar day is slightly longer than the solar day being approximately 24 hours 50 minutes and 28 seconds. Consequently high tide on one day will be slightly later on the following day. tidal range - the difference between high and low tide.